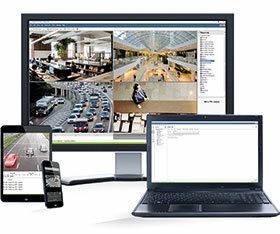 The CathexisVision IP Video Management Software suite provides an extensive range of sophisticated solutions to satisfy all security and infrastructure management requirements across a wide variety of market sectors. These sectors include retail, banking, mining, education campuses, residential and commercial estates, manufacturing, healthcare, transport, logistics and city surveillance among many others. The open architecture enables the seamless integration of IP cameras, recording servers, viewing infrastructure, and a wide range of third-party systems suited to various applications. This provides clients with optimum security solutions and maximum return on investment. CathexisVision Video Management Software is intuitive, user-friendly and allows for easy and accurate installation. So, whether the surveillance requirement is for a single site, a chain of small retail stores, a complex organisation with outlets across borders and continents, or mining operations with thousands of cameras, the CathexisVision range has an ideal solution.